Wrapped in vibrant green paracord and displaying a sleek design, the 3 Piece Two Tone Leaf Throwing Knives are an elegant addition to any throwing knife collection. The sharpened throwing blades are black with beveled chrome edges. Crafted from 440 stainless steel, the throwing knife set also includes a nylon sheath for wearing and storing the knives. The full tang handle wrapped with cord provides a non slip grip. The lanyard hole in the handle is great for a tassel or ribbon for training purposes. 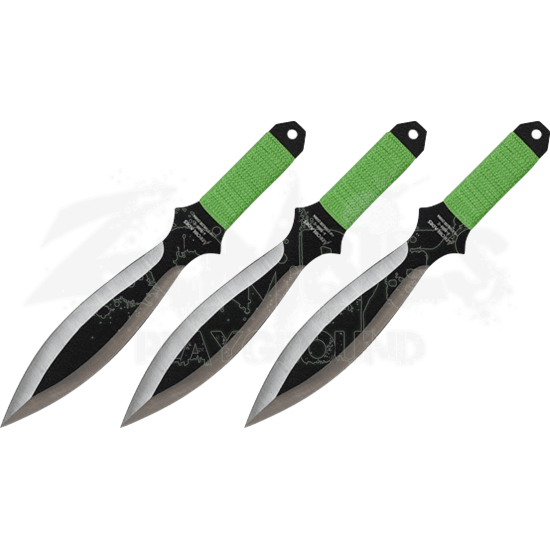 Precision crafted for competition or recreation, the 3 Piece Two Tone Leaf Throwing Knives make a fantastic gift for any knife enthusiast.